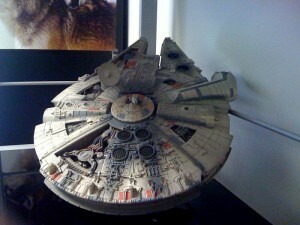 The one I saw at ILM was an original. Those go for $1075 and I opted not to consider buying that. 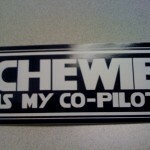 If it was a Han/Chewie…maybe…. Now I *really* have to stop buying any prints/artwork until I take what I have in for framing. Limited edition!! Only 1980 (get it?)! And it’s got a CV patch on him! 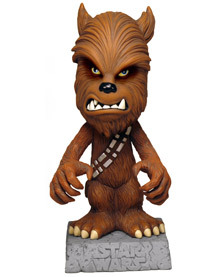 To match my other Chewbacca bobble on my desk :) Plus it’s almost Halloween! 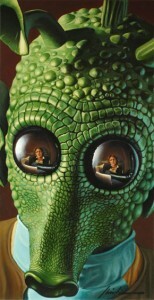 To note: the StarWars.com online store now has MUCH better shipping rates! They used to be highway robbery! Good for them!! 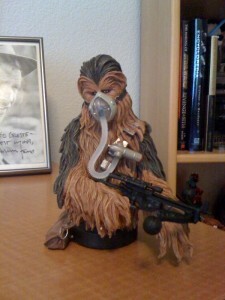 Was able to snag the Mynock Chewbacca bust from Gentle Giant! LOVE it! Received it last week and put it up today! 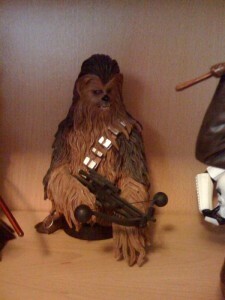 That Chewie statue was my very first Gentle Giant collectible. Loved it soooo much when I received it . Still do. 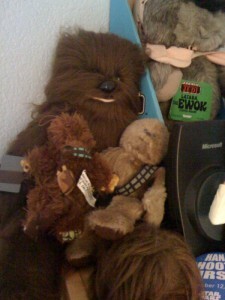 My husband bought me this Chewie plush. 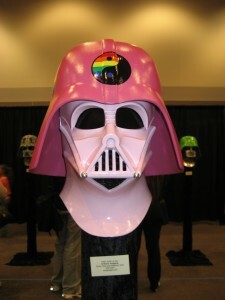 It’s an original from 1977 – Star Wars era. Tag still attached. 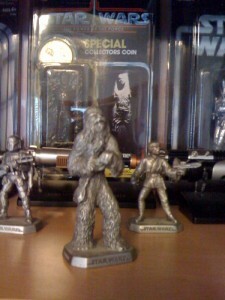 I was very happy with this prize :) Little Chewies on his lap are from other lines and not 70s. 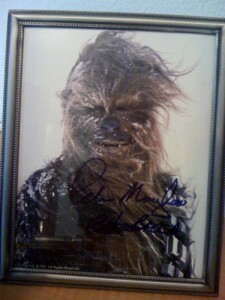 My signed Peter Mayhew pic. Got this at Wonder Con in SF. TESB is my favorite movie ever so wanted this pic signed. He is a very nice guy. VERY tall!! But a very, very nice guy. 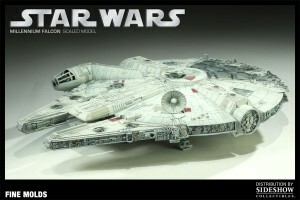 New Millennium Falcon from Sideshow! 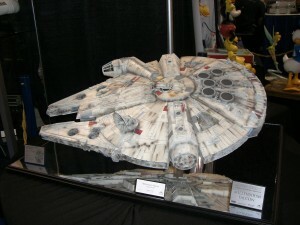 But as I was perusing the Sideshow Collectibles site for their convention pre-orders I saw their new Millennium Falcon. Wow! This is a pretty awesome collectible! It’s a GREAT piece. I remember when I bought it and how excited I was! 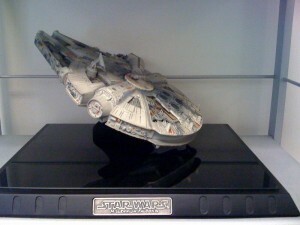 I believe it was the 3rd or 4th relatively pricey Star Wars collectible I bought. I had been collecting mostly the action figure/toy lines up until then. 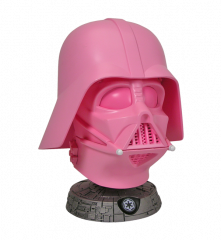 Of course, I think that’s right around the same time Gentle Giant, Master Replicas, Sideshow and others all decided that little geeks grew up to be adult geeks who had cash to spend and the same geeky passion for Star Wars. Damn that George Lucas!! 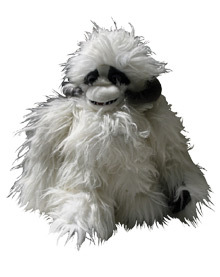 I did most of my original toy collecting right before and after (and forever after) this movie (TESB) came out. Had more allowance to spend :) And yes, I kept them all unplayed with (had them on display in my room) and kept the boxes. Close up this thing is AWESOME! And it’s big! Like 3 feet wide! Sigh…there is one on eBay right now ending Thursday. The bank probably wouldn’t mind if the mortgage payment was short $3000 – right? Right?? This is a short, old video starring Mark Hamill, Harrison Ford (swoon) and Carrie Fisher (in her Slave Leia bikini!) 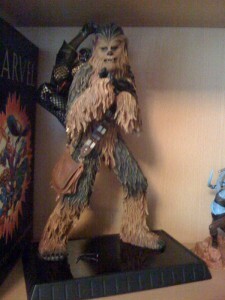 plus C-3P0, Chewbacca, Boba Fett and more!